CMEC entered the Sri Lankan market in 2004 and seized the development opportunity of the "Belt and Road" initiative. After years of hard work, CMEC has completed landmark projects in Sri Lanka and built up the monument of people-to-people connection. CMEC currently hires 34 local workers in Sri Lanka, and Kevin was one of the earliest to enter the company and serves as a driver on the project site. In 2007, Sri Lanka was still in the flames of civil war, and it took more than four hours to drive from the capital Colombo to the project site of Puttlam coal-fired power plant. Kevin set out early and came back at dusk every day, but he never complained. He checks the vehicle conditions and cleans it every day, providing a clean, comfortable and safe ride environment. Time flies and by far Kevin has worked at CMEC for nine years. He grows up with CMEC in Sri Lanka and has also paid off the debt he had previously owed for business failure, and his two children are now being well educated. He told us that it would be the best and proudest choice for his daughters to work in a Chinese enterprise like CMEC after graduating from college. However, something unexpected may happen any time. In August 2016, Kevin often coughed and felt discomfort in his chest. After repeated requirements by the company, he went to the hospital for a check-up. In early September 2016, he was diagnosed with cardiovascular thrombus, with 90% of both the left main artery and two branches for heart blood-supply obstructed, and 40% of the right main artery obstructed, which could be life-threatening at any moment and must be treated as soon as possible. In Sri Lanka, universal free medical care is provided but public hospitals are often overcrowded and the conditions are very poor, and the earliest time for Kevin to undergo the surgery in a public hospital would be four months later. Sri Lanka has two private hospitals with advanced medical equipment, which can perform the operation a few days after appointment, but it is so expensive that Kevin's family could not afford it. As Kevin felt desperate, CMEC told him that 80% of the surgery cost had been collected for him. It turned out that at the time of his physical examination, CMEC was paying close attention but did not want to hurt this kind and unlucky man. A CMEC employee presented Kevin's difficulties in the WeChat group, and after a few seconds, Chinese employees in the group responded actively and were willing to help this local colleague. In the afternoon, almost all of CMEC's project staff in Sri Lanka sent their donations to the supervisors of project departments. Colleagues in the project department of Maldives also made donations via WeChat transfer. The Sri Lanka project department's colleagues in China also volunteered to donate after learning the news. What's more touching is that even the sub-contractor of Puttlam coal-fired power plant organized donations. In addition, many employees who have never come into contact with Kevin actively made donation. Thus, donations came from all sides. On the morning of the next day, all project departments sent the life-saving donation to Colombo. In the afternoon, Chinese staff of CMEC came to Sri Lanka hospital along with Kevin and asked more about the disease and requested the doctor to arrange the surgery as soon as possible. When the doctor learned that Kevin had raised a large amount of operation fee within one day, he raised his thumb and said with deep emotion, "People of my country can work in such a good Chinese company, I am very happy for them, and I will do my best in the operation." On the third morning, Kevin went to the inpatient ward of Sri Lanka hospital for physical examination and waited for the surgery two days later. Yet there came another problem that bothered him - heart surgery requires blood transfusion. In the case of blood transfusion from the hospital's blood bank, it was expensive, but of his relatives, two daughters were young and weak. The doctor suggested that a certain amount of blood could be donated by five people regardless of the blood types, then the hospital could provide the blood required by Kevin's surgery for free. After getting the news, Chinese employees and local staff in Colombo all expressed their willingness to donate blood as required by the hospital. Finally, the total amount of blood donated by CMEC employees far exceeded the amount of blood that Kevin needed. On the third morning after hospital admission, Kevin had a smooth operation, which lasted until 5p.m. of the same day. In the intraoperative period, Chinese employees kept asking the progress of surgery in the WeChat group, and everyone was concerned about Kevin. A local employee went to the temple early in the day to pray for Kevin. At five o'clock in the afternoon, Kevin came out of the operating room. After a period of anesthetic recovery, he finally opened his eyes with a relieved smile. During the week of hospital rest, many CMEC employees actively went to see him and brought him necessities of life. Kevin's wife did not speak English, before the surgery, she always wore a worried frown and was tearful. But when an endless stream of CMEC employees visited every day after the surgery, she held their hands and expressed her gratitude through clapping hands and eye contact. One week later, Kevin was discharged smoothly, and returned to work after complete recovery in a few months. Jodica·Rasangarner is a subcontractor of Puttlam coal-fired power plant. One day, he drove to the office to check whether the power supply of the International Trade Office he operated was normal in case the business was affected. Recently, the weather is getting hot, fans and air conditioners are all switched on, so Jodica checks the power supply every day. A few years ago, in case of the sauna weather, the utilization of electricity in Sri Lanka would be more intense, when the limit of time, power and current was a common thing and frequent tripping was still vivid in mind. Nowadays, everything goes well. His current main task is to help the Chinese Embassy in Sri Lanka and CMEC to step up efforts to obtain permission to renovate the schoolhouse and gate of Faxian Stone Village primary school. For this matter, Jodica has gone to and fro between Colombo and Faxian Stone Village for many times. Faxian Stone Village in Sri Lanka is located in the long and narrow valley over 50 kilometers south of the capital Colombo. In the old days, Faxian, eminent monk of the Eastern Jin Dynasty once took a rest in the cave nearby and gave sermons, therefore, local people replaced the village name with Faxian Stone Village to commemorate the great contribution of master Faxian. In the 1980s, with the help of the Chinese government, Faxian Stone Village started large-scale construction and built many houses and farmhouses and Faxian Primary School. After 30 years of vicissitudes, buildings of Faxian Primary School have already dilapidated. In October 2016, the Chinese Embassy in Sri Lanka decided to contribute capital again to renovate the buildings and main entrance of Faxian Stone Village's primary school and invited CMEC to find suitable construction units. On hearing this news, Jodica contacted CMEC at first time and volunteered to take charge of the project. In fact, this was not the first time for Jodica to participate in social welfare activities of CMEC in Sri Lanka. In May 2015, Jodica received a notice from the Ceylon Electricity Board inviting his company to undertake an upgrade project of the playground at Ananda National School in Puttlam. The project was launched by Minister of the electricity department of Puttlam, Ceylon Electricity Board and CMEC, and the fund was fully provided by Puttlam coal-fired power station. "CMEC", "Puttlam coal-fired power plant"? Familiar names rolled over in the mind of Jodica. Isn't CMEC the company that constructed Puttlam coal-fired power plant? This power plant supplies more than 1/3 of the electric power in Sri Lanka. Now it is going to contribute to the renovation of the school where the power plant is located. Jodica who has been insistent on social welfare and charity for 10 years knows that he is duty-bound as a subcontractor. After three months of design, approval and preparation of construction materials, the playground upgrade project of Ananda National School kicked off in September 2015. After the project was started, although full preparation has been made, there are always some unexpected situations in the construction process. For some unexpected cost of design changes, Jodica insisted on self-paying. At such moment, he always smiled naively and said: "Chinese people have given us so much help, building power stations and donating schools, all of which are your kindness to the people of Sri Lanka. Now I just want to make a pygmy effort to build common memory and history of China and Sri Lanka together with you!" In the final phase of the school repairs, Jodica had a car accident, but he still required that the staff report the project progress every day. 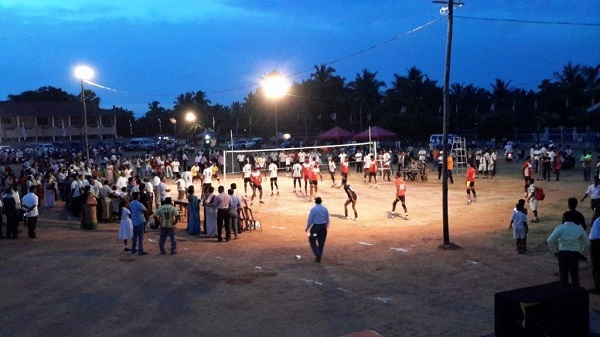 When he got a little better, he went to the site to inspect work, and after the successful completion of the project, he funded a volleyball court for the school. By the end of June 2016, within just nine months, the playground of Puttlam Ananda National School took on a new look and the playground was put into use. Jodica said that when seeing the children running on the new playground happily with bright smile, everything was worth paying. Whenever it comes to social welfare and children, Jodica will have a child-like pure smile. At present, Jodica has signed a cooperation contract with CMEC to renovate the buildings and gate of Faxian Stone Village primary school at a 10% discount on his quotation. Both Jodica and CMEC are practitioners, dedicators, beneficiaries and sharers of people connection under the "Belt and Road" initiative. Amity between people holds the key to the sound relations between states. When the people have no connection, how to carry out trade and business? CMEC people have sowed the seeds of love on the land of Sri Lanka and tied the hearts of the two peoples together through people-benefit projects one after another. Along the "Belt and Road" route, kind and intelligent CMEC people are heading for a better tomorrow.